Raaga.com: Thala Ajith’s VEDHALAM dampens Salman Khan’s Prem Ratan Dhan Payo's advance booking in South! Thala Ajith’s VEDHALAM dampens Salman Khan’s Prem Ratan Dhan Payo's advance booking in South! In a bid to attract maximum crowds and exploit the Diwali festival holidays to the hilt Salman Khan’s PREM RATAN DHAN PAYO's advance booking began five days in advance both at multiplexes and at single screen theaters. To reach out at maximum cine buff both Salman Khan and Sonam Kapoor took to twitter and informed the cinegoers about the advance book bonanza. The advance booking that opened on Saturday November 7, 2015 as expected has opened to an overwhelming response. Trade pundits informed that the maximum rush to book the tickets have been reported from Kolkata. The second on the list is Mumbai followed by Delhi and Punjab. However the movie has failed to generate a similar kind of passion down South as South superstar Ajith’s VEDHALAM is also releasing on November 10. 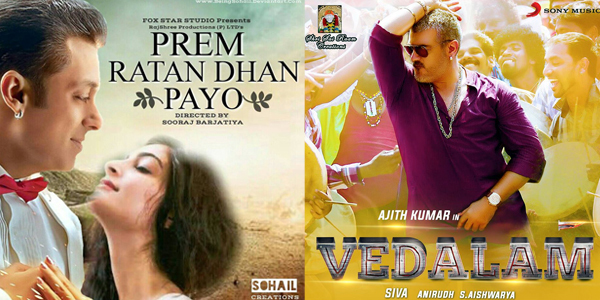 Hence movie buffs down South have shown their preference to VEDHALAM than PREM RATAN DHAN PAYO. As a result in cities like Hyderabad and Chennai, PREM RATAN DHAN PAYO’s advance booking has thus shown a below average opening. It may noted that VEDHALAM’s online advance booking started two days prior to Salman Khan’s PREM RATAN DHAN PAYO i.e. from November 5 and has reported an excellent response. According to a trade expert, “As soon the VEDHALAM’s online advance booking began; within seconds the movie reached the top slot.” “Not just in Chennai, the advance booking has kicked off in foreign countries, including Indonesia and Denmark,” he quipped. Like Salman’s PREM RATAN DHAN PAYO, Ajith’s VEDHALAM is also the most awaited film of the year. The film is directed by Siva and produced by Aishwarya. The highlight of the film is the first time combination of Thala Ajith with the gorgeous Shruti Haasan.